It has been suggested that Politics of Maryland be merged into this article. (Discuss) Proposed since March 2019. This article is about the U.S. state of Maryland. For other uses, see Maryland (disambiguation). 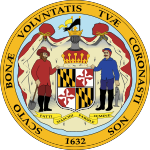 Motto(s): "Fatti maschii, parole femine"
State song(s): ""Maryland, My Maryland" (1861, adopted 1939)"
Maryland (/ˈmɛərɪlənd/ ( listen) MAIR-ih-lənd) is a state in the Mid-Atlantic region of the United States, bordering Virginia, West Virginia, and the District of Columbia to its south and west; Pennsylvania to its north; and Delaware to its east. The state's largest city is Baltimore, and its capital is Annapolis. Among its occasional nicknames are Old Line State, the Free State, and the Chesapeake Bay State. It is named after the English queen Henrietta Maria, known in England as Queen Mary. Sixteen of Maryland's twenty-three counties border the tidal waters of the Chesapeake Bay estuary and its many tributaries, which combined total more than 4,000 miles of shoreline. Although one of the smallest states in the U.S., it features a variety of climates and topographical features that have earned it the moniker of America in Miniature. In a similar vein, Maryland's geography, culture, and history combines elements of the Mid-Atlantic, Northeastern, and South Atlantic regions of the country. One of the original Thirteen Colonies of Great Britain, Maryland was founded by George Calvert, a Catholic convert who sought to provide a religious haven for Catholics persecuted in England. In 1632, Charles I of England granted Calvert a colonial charter, naming the colony after his wife, Queen Mary. Unlike the Pilgrims and Puritans, who enforced religious conformity in their settlements, Calvert envisioned a colony where people of different religious sects would coexist under the principle of toleration. Accordingly, in 1649 the Maryland General Assembly passed an Act Concerning Religion, which enshrined this principle by penalizing anyone who "reproached" a fellow Marylander based on religious affiliation. Nevertheless, religious strife was common in the early years, and Catholics remained a minority, albeit in greater numbers than in any other English colony. 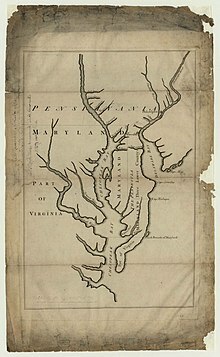 Maryland's early settlements and population centers clustered around rivers and other waterways that empty into the Chesapeake Bay. Its economy was heavily plantation-based, centered mostly on the cultivation of tobacco. The need for cheap labor led to a rapid expansion of indentured servants, penal labor, and African slaves. In 1760, Maryland's current boundaries took form following the settlement of a long-running border dispute with Pennsylvania. Maryland was an active participant in the events leading up to the American Revolution, and by 1776 its delegates signed the Declaration of Independence. Many of its citizens subsequently played key political and military roles in the war. In 1790, the state ceded land for the establishment of the U.S. capital of Washington, D.C. Although a slave state, Maryland remained in the Union during the U.S. Civil War, its strategic location giving it a significant role in the conflict. After the war, Maryland took part in the Industrial Revolution, driven by its seaports, railroad networks, and mass immigration from Europe. Since the Second World War, the state's population has grown rapidly, to approximately six million residents, and it is among the most densely populated states in the nation. As of 2015[update], Maryland had the highest median household income of any state, owing in large part to its close proximity to Washington, D.C. and a highly diversified economy spanning manufacturing, services, higher education, and biotechnology. Maryland has been ranked as one of the best governed states in the country. The state's central role in American history is reflected by its hosting of some of the highest numbers of historic landmarks per capita. 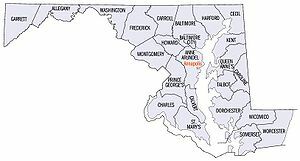 Maryland has an area of 12,406.68 square miles (32,133.2 km2) and is comparable in overall area with Belgium (11,787 square miles (30,530 km2)). It is the 42nd largest and 9th smallest state and is closest in size to the state of Hawaii (10,930.98 square miles (28,311.1 km2)), the next smaller state. The next larger state, its neighbor West Virginia, is almost twice the size of Maryland (24,229.76 square miles (62,754.8 km2)). Great Falls on the Potomac River. Maryland is bounded on its north by Pennsylvania, on its west by West Virginia, on its east by Delaware and the Atlantic Ocean, and on its south, across the Potomac River, by West Virginia and Virginia. The mid-portion of this border is interrupted by District of Columbia, which sits on land that was originally part of Montgomery and Prince George's counties and including the town of Georgetown, Maryland. This land was ceded to the United States Federal Government in 1790 to form the District of Columbia. (The Commonwealth of Virginia gave land south of the Potomac, including the town of Alexandria, Virginia, however Virginia retroceded its portion in 1846). The Chesapeake Bay nearly bisects the state and the counties east of the bay are known collectively as the Eastern Shore. Typical freshwater river above the tidal zone. The Patapsco River includes the famous Thomas Viaduct and is part of the Patapsco Valley State Park. Later, the river forms the Inner Harbor as it empties into the Chesapeake Bay. Tidal wetlands of the Chesapeake Bay, the largest estuary in the United States and the largest water feature in Maryland. Most of the state's waterways are part of the Chesapeake Bay watershed, with the exceptions of a tiny portion of extreme western Garrett County (drained by the Youghiogheny River as part of the watershed of the Mississippi River), the eastern half of Worcester County (which drains into Maryland's Atlantic coastal bays), and a small portion of the state's northeast corner (which drains into the Delaware River watershed). So prominent is the Chesapeake in Maryland's geography and economic life that there has been periodic agitation to change the state's official nickname to the "Bay State", a nickname that has been used by Massachusetts for decades. Earthquakes in Maryland are infrequent and small due to the state's distance from seismic/earthquake zones. The M5.8 Virginia earthquake in 2011 was felt moderately throughout Maryland. Buildings in the state are not well-designed for earthquakes and can suffer damage easily. Maryland has no natural lakes, mostly due to the lack of glacial history in the area. All lakes in the state today were constructed, mostly via dams. Buckel's Bog is believed by geologists to have been a remnant of a former natural lake. Black-eyed susans, the state flower, grow throughout much of the state. As is typical of states on the East Coast, Maryland's plant life is abundant and healthy. A good dose of annual precipitation helps to support many types of plants, including seagrass and various reeds at the smaller end of the spectrum to the gigantic Wye Oak, a huge example of white oak, the state tree, which can grow in excess of 70 feet (21 m) tall. The state harbors a great number of white-tailed deer, especially in the woody and mountainous west of the state, and overpopulation can become a problem. Mammals can be found ranging from the mountains in the west to the central areas and include black bears, bobcats, foxes, coyotes, raccoons, and otters. Maryland joined with neighboring states during the end of the 20th century to improve the health of the Chesapeake Bay. The bay's aquatic life and seafood industry have been threatened by development and by fertilizer and livestock waste entering the bay. The Piedmont region—which includes northern and western greater Baltimore, Westminster, Gaithersburg, Frederick, and Hagerstown—has average seasonal snowfall totals generally exceeding 20 inches (51 cm) and, as part of USDA Hardiness zones 7b and 7a, temperatures below 10 °F (−12 °C) are less rare. From the Cumberland Valley on westward, the climate begins to transition to a humid continental climate (Köppen Dfa). Precipitation in the state is characteristic of the East Coast. Annual rainfall ranges from 35 to 45 inches (890 to 1,140 mm) with more in higher elevations. Nearly every part of Maryland receives 3.5–4.5 inches (89–114 mm) per month of rain. Average annual snowfall varies from 9 inches (23 cm) in the coastal areas to over 100 inches (250 cm) in the western mountains of the state. 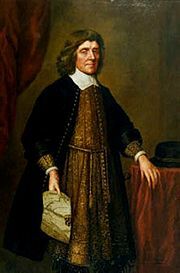 Cecil Calvert, 2nd Baron Baltimore, 1st Proprietor of the Maryland colony. The original capital of Maryland was St. Mary's City, on the north shore of the Potomac River, and the county surrounding it, the first erected/created in the province, was first called Augusta Carolina, after the King, and later named St. Mary's County. 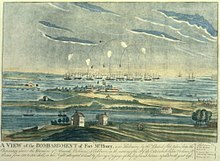 The bombardment of Fort McHenry in Baltimore inspired the song, "Star Spangled Banner". Influenced by a changing economy, revolutionary ideals, and preaching by ministers, numerous planters in Maryland freed their slaves in the 20 years after the Revolutionary War. Across the Upper South the free black population increased from less than 1% before the war to 14% by 1810. Abolitionist Harriet Tubman was born a slave during this time in Dorchester County, Maryland. The National Road (U.S. Hwy 40 today) was authorized in 1817 and ran from Baltimore to St. Louis – the first federal highway. The Baltimore and Ohio Railroad (B&O) was the first chartered railroad in the United States. It opened its first section of track for regular operation in 1830 between Baltimore and Ellicott City, and in 1852 it became the first rail line to reach the Ohio River from the eastern seaboard. The state remained with the Union during the Civil War, due in significant part to demographics and Federal intervention. The 1860 census, held shortly before the outbreak of the civil war, showed that 49% of Maryland's African Americans were free blacks. The Battle of Antietam was the single bloodiest day of the Civil War with nearly 23,000 casualties. Governor Thomas Holliday Hicks suspended the state legislature, and to help ensure the election of a new pro-union governor and legislature, President Abraham Lincoln had a number of its pro-slavery politicians arrested, including the Mayor of Baltimore, George William Brown; suspended several civil liberties, including habeas corpus; and ordered artillery placed on Federal Hill overlooking Baltimore. Historians debate the constitutionality of these wartime actions, and the suspension of civil liberties was later deemed illegal by the U.S. Supreme Court. The Democratic Party rapidly regained power in the state from Republicans. Democrats replaced the Constitution of 1864 with the Constitution of 1867. Following the end of Reconstruction in 1877, Democrats devised means of disfranchising blacks, initially by physical intimidation and voter fraud, later by constitutional amendments and laws. Blacks and immigrants, however, resisted Democratic Party disfranchisement efforts in the state. Maryland blacks were part of a biracial Republican coalition elected to state government in 1896–1904 and comprised 20% of the electorate. The Progressive Era of the late 19th and early 20th centuries brought political reforms. In a series of laws passed between 1892 and 1908, reformers worked for standard state-issued ballots (rather than those distributed and marked by the parties); obtained closed voting booths to prevent party workers from "assisting" voters; initiated primary elections to keep party bosses from selecting candidates; and had candidates listed without party symbols, which discouraged the illiterate from participating. These measures worked against ill-educated whites and blacks. Blacks resisted such efforts, with suffrage groups conducting voter education. Blacks defeated three efforts to disfranchise them, making alliances with immigrants to resist various Democratic campaigns. Disfranchising bills in 1905, 1907, and 1911 were rebuffed, in large part because of black opposition. Blacks comprised 20% of the electorate and immigrants comprised 15%, and the legislature had difficulty devising requirements against blacks that did not also disadvantage immigrants. After Georgia congressman William D. Upshaw criticized Maryland openly in 1923 for not passing Prohibition laws, Baltimore Sun editor Hamilton Owens coined the "Free State" nickname for Maryland in that context, which was popularized by H. L. Mencken in a series of newspaper editorials. Maryland's urban and rural communities had different experiences during the Great Depression. The "Bonus Army" marched through the state in 1932 on its way to Washington, D.C. Maryland instituted its first ever income tax in 1937 to generate revenue for schools and welfare. Passenger and freight steamboat service, once important throughout Chesapeake Bay and its many tributary rivers, ended in 1938. Baltimore was a major war production center during World War II. The biggest operations were Bethlehem Steel's Fairfield Yard, which built Liberty ships; and Glenn Martin, an aircraft manufacturer. Maryland experienced population growth following World War II. Beginning in the 1960s, as suburban growth took hold around Washington DC and Baltimore, the state began to take on a more mid-Atlantic culture as opposed to the traditionally Southern and Tidewater culture that previously dominated most of the state. Agricultural tracts gave way to residential communities, some of them carefully planned such as Columbia, St. Charles, and Montgomery Village. Concurrently the Interstate Highway System was built throughout the state, most notably I-95, I-695, and the Capital Beltway, altering travel patterns. In 1952 the eastern and western halves of Maryland were linked for the first time by the Chesapeake Bay Bridge, which replaced a nearby ferry service. Maryland's regions experienced economic changes following WWII. Heavy manufacturing declined in Baltimore. In Maryland's four westernmost counties, industrial, railroad, and coal mining jobs declined. On the lower Eastern Shore, family farms were bought up by major concerns and large-scale poultry farms and vegetable farming became prevalent. In Southern Maryland, tobacco farming nearly vanished due to suburban development and a state tobacco buy-out program in the 1990s. The United States Census Bureau estimates that the population of Maryland was 6,042,718 on July 1, 2018, a 4.66% increase since the 2010 United States Census and an decrease of 9,459, from the prior year. This includes a natural increase since the last census of 269,166 people (that is 464,251 births minus 275,093 deaths) and an increase due to net migration of 116,713 people into the state. Immigration from outside the United States resulted in a net increase of 129,730 people, and migration within the country produced a net loss of 13,017 people. Maryland's history as a border state has led it to exhibit characteristics of both the Northern and Southern regions of the United States. Generally, rural Western Maryland between the West Virginian Panhandle and Pennsylvania has an Appalachian culture; the Southern and Eastern Shore regions of Maryland embody a Southern culture, while densely populated Central Maryland—radiating outward from Baltimore and Washington, D.C.—has more in common with that of the Northeast. The U.S. Census Bureau designates Maryland as one of the South Atlantic States, but it is commonly associated with the Mid-Atlantic States and/or Northeastern United States by other federal agencies, the media, and some residents. Maryland's population is concentrated mostly in the Baltimore and Washington metropolitan areas. Most of the population of Maryland lives in the central region of the state, in the Baltimore Metropolitan Area and Washington Metropolitan Area, both of which are part of the Baltimore-Washington Metropolitan Area. The majority of Maryland's population is concentrated in the cities and suburbs surrounding Washington, D.C., as well as in and around Maryland's most populous city, Baltimore. Historically, these and many other Maryland cities developed along the Fall Line, the line along which rivers, brooks, and streams are interrupted by rapids and/or waterfalls. Maryland's capital city, Annapolis, is one exception to this pattern, since it lies along the banks of the Severn River, close to where it empties into the Chesapeake Bay. 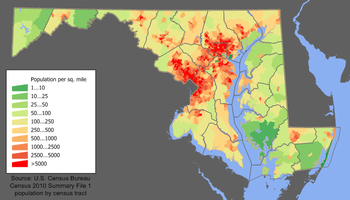 The Eastern Shore is less populous and more rural, as are the counties of western Maryland. The two westernmost counties of Maryland, Allegany and Garrett, are mountainous and sparsely populated, resembling West Virginia and Appalachia more than they do the rest of Maryland. Both eastern and western Maryland are, however, dotted with cities of regional importance, such as Ocean City, Princess Anne, and Salisbury on the Eastern Shore and Cumberland, Frostburg, and Hancock in Western Maryland. Southern Maryland is still somewhat rural, but suburbanization from Washington, D.C. has encroached significantly since the 1960s; important local population centers include Lexington Park, Prince Frederick, and Waldorf. African Americans form a sizable portion of the state's population – nearly 30 percent in 2010. Most are descendants of people transported to the area as slaves from West Africa, and many are of mixed race, including European and Native American ancestry. New residents of African descent include 20th-century and later immigrants from Nigeria, particularly of the Igbo and Yoruba tribes. Maryland also hosts populations from other African and Caribbean nations. Concentrations of African Americans live in Baltimore City, Prince George's County, a suburb of Washington, D.C., where many work; Charles County, western parts of Baltimore County, and the southern Eastern Shore. Many immigrants from the Horn of Africa have settled in Maryland, with large communities existing in the suburbs of Washington, D.C. (particularly Montgomery County and Prince George's County) and the city of Baltimore. The Greater Washington area has the largest population of Ethiopians outside of Africa. The Ethiopian community of Greater DC was historically based in Washington D.C.'s Adams Morgan and Shaw neighborhoods, but as the community has grown, many Ethiopians have settled in Silver Spring. The Washington, D.C. metropolitan area is also home to large Eritrean and Somali communities. Irish American populations can be found throughout the Baltimore area, and the Northern and Eastern suburbs of Washington D.C. in Maryland (descendants of those who moved out to the suburbs of Washington's once predominantly Irish neighborhoods), as well as Western Maryland, where Irish immigrant laborers helped to build the B & O Railroad. Smaller but much older Irish populations can be found in Southern Maryland, with some roots dating as far back as the early Maryland colony. This population, however, still remains culturally very active and yearly festivals are held. Large ethnic minorities include Eastern Europeans such as Croatians, Belarusians, Russians and Ukrainians. The shares of European immigrants born in Eastern Europe increased significantly between 1990 and 2010. Following the dissolution of the Soviet Union, Yugoslavia, and Czechoslovakia, many immigrants from Eastern Europe came to the United States - 12 percent of which currently reside in Maryland. Jews are numerous throughout Montgomery County and in Pikesville and Owings Mills northwest of Baltimore. An estimated 81,500 Jewish Americans live in Montgomery County, constituting approximately 10% of the total population. Asian Americans are concentrated in the suburban counties surrounding Washington, D.C. and in Howard County, with Korean American and Taiwanese American communities in Rockville, Gaithersburg, and Germantown and a Filipino American community in Fort Washington. Numerous Indian Americans live across the state, especially in central Maryland. Amish/Mennonite communities are found in St. Mary's, Garrett, and Cecil counties. As of 2017, non-Hispanic white Americans were 50.9% of Maryland's population, making Maryland on the verge of becoming a majority minority state. 49.1% of Maryland's population is non-white and/or Hispanic/Latino, the highest percentage of any state on the East Coast and the highest percentage after the majority minority states of Hawaii, New Mexico, Texas, California and Nevada. Non-Hispanic White Americans in Maryland, the majority as of 2016, are expected to become the plurality ethnic group within 5 years of 2015. After Nevada in 2016, Maryland is projected to be the next state to become majority minority due to growing African-American, Asian and Latino populations. By 2031, minorities are projected to become the majority of voting eligible residents of Maryland. 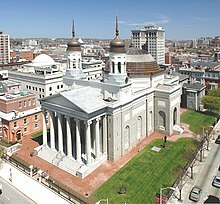 The Baltimore Basilica was the first Catholic cathedral built in the U.S.. The Bureau of Economic Analysis estimates that Maryland's gross state product in 2016 was $382.4 billion. However, Maryland has been using Genuine Progress Indicator, an indicator of well-being, to guide the state's development, rather than relying only on growth indicators like GDP. According to the U.S. Census Bureau, Maryland households are currently the wealthiest in the country, with a 2013 median household income of $72,483 which puts it ahead of New Jersey and Connecticut, which are second and third respectively. Two of Maryland's counties, Howard and Montgomery, are the second and eleventh wealthiest counties in the nation respectively. Maryland ranked No. 1 with the most millionaires per capita in 2013, with a ratio of 7.7 percent. Also, the state's poverty rate of 7.8 percent is the lowest in the country. per capita personal income in 2006 was $43,500, fifth in the nation. As of February 2018, the state's unemployment rate was 4.2 percent. A map showing Maryland's median income by county. Data is sourced from the 2014 ACS 5-year Estimate report published by the US Census Bureau. The Chesapeake and Delaware Canal is a 14 miles (23 km) canal on the Eastern Shore that connects the waters of the Delaware River with those of the Chesapeake Bay, and in particular with the Port of Baltimore, carrying 40 percent of the port's ship traffic. Agriculture is an important part of the state's economy. The beach resort town of Ocean City along the Atlantic Ocean is a popular tourist destination in Maryland. 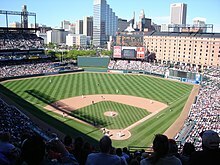 Tourism is popular in Maryland, with tourists visiting the city of Baltimore, the beaches of the Eastern Shore, and the nature of western Maryland, as well as many passing through on the way to Washington, D.C. Baltimore attractions include the Harborplace, the Baltimore Aquarium, Fort McHenry, as well as the Camden Yards baseball stadium. 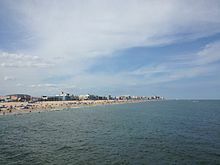 Ocean City on the Atlantic Coast has been a popular beach destination in summer, particularly since the Chesapeake Bay Bridge was built in 1952 connecting the Eastern Shore to the more populated Maryland cities. The state capital of Annapolis offers sites such as the state capitol building, the historic district, and the waterfront. Maryland also has several sites of interest to military history, given Maryland's role in the American Civil War and in the War of 1812. Other attractions include the historic and picturesque towns along the Chesapeake Bay, such as Saint Mary's, Maryland's first colonial settlement and original capital. Maryland's Interstate highways include 110 miles (180 km) of Interstate 95 (I-95), which enters the northeast portion of the state, travels through Baltimore, and becomes part of the eastern section of the Capital Beltway to the Woodrow Wilson Bridge. I-68 travels 81 miles (130 km), connecting the western portions of the state to I-70 at the small town of Hancock. I-70 enters from Pennsylvania north of Hancock and continues east for 93 miles (150 km) to Baltimore, connecting Hagerstown and Frederick along the way. I-83 has 34 miles (55 km) in Maryland and connects Baltimore to southern central Pennsylvania (Harrisburg and York, Pennsylvania). Maryland also has an 11-mile (18 km) portion of I-81 that travels through the state near Hagerstown. I-97, fully contained within Anne Arundel County and the shortest (17.6 miles (28.3 km)) one- or two-digit interstate highway in the contiguous US, connects the Baltimore area to the Annapolis area. There are also several auxiliary Interstate highways in Maryland. Among them are two beltways encircling the major cities of the region: I-695, the McKeldin (Baltimore) Beltway, which encircles Baltimore; and a portion of I-495, the Capital Beltway, which encircles Washington, D.C. I-270, which connects the Frederick area with Northern Virginia and the District of Columbia through major suburbs to the northwest of Washington, is a major commuter route and is as wide as fourteen lanes at points. I-895, also known as the Harbor Tunnel Thruway, provides an alternate route to I-95 across the Baltimore Harbor. The Chesapeake Bay Bridge connects Maryland's Eastern and Western Shores. Maryland's largest airport is Baltimore-Washington International Thurgood Marshall Airport, more commonly referred to as BWI. The airport is named for the Baltimore-born Thurgood Marshall, the first African-American Supreme Court justice. The only other airports with commercial service are at Hagerstown and Salisbury. The Maryland suburbs of Washington, D.C. are also served by the other two airports in the region, Ronald Reagan Washington National Airport and Dulles International Airport, both in Northern Virginia. The College Park Airport is the nation's oldest, founded in 1909, and is still used. Wilbur Wright trained military aviators at this location. Amtrak trains, including the high speed Acela Express serve Baltimore's Penn Station, BWI Airport, New Carrollton, and Aberdeen along the Washington D.C. to Boston Northeast Corridor. In addition, train service is provided to Rockville and Cumberland by Amtrak's Washington, D.C., to Chicago Capitol Limited. 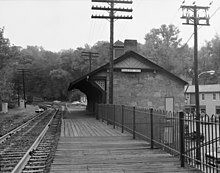 Ellicott City Station, on the original B&O Railroad line, is the oldest remaining passenger station in the United States. The rail line is still used by CSX Transportation for freight trains, and the station is now a museum. The WMATA's Metrorail rapid transit and Metrobus local bus systems (the 2nd and 6th busiest in the nation of their respective modes) provide service in Montgomery and Prince George's counties and connect them to Washington D.C., with the express Metrobus Route B30 serving BWI Airport. The Maryland Transit Administration (often abbreviated as "MTA Maryland"), a state agency part of the Maryland Department of Transportation also provides transit services within the state. Headquartered in Baltimore, MTA's transit services are largely focused on central Maryland, as well as some portions of the Eastern Shore and Southern MD. Baltimore's Light RailLink and Metro SubwayLink systems serve its densely populated inner-city and the surrounding suburbs. The MTA also serves the city and its suburbs with its local bus service (the 9th largest system in the nation). The MTA's Commuter Bus system provides express coach service on longer routes connecting Washington D.C. and Baltimore to parts of Central and Southern MD as well as the Eastern Shore. The commuter rail service, known as MARC, operates three lines which all terminate at Washington Union Station and provide service to Baltimore's Penn and Camden stations, Perryville, Frederick, and Martinsburg, WV. In addition, many suburban counties operate their own local bus systems which connect to and complement the larger MTA and WMATA/Metro services. Freight rail transport is handled principally by two Class I railroads, as well as several smaller regional and local carriers. CSX Transportation has more extensive trackage throughout the state, with 560 miles (900 km), followed by Norfolk Southern Railway. Major rail yards are located in Baltimore and Cumberland, with an intermodal terminal (rail, truck and marine) in Baltimore. The reverse side of the Maryland quarter shows the dome of the State House in Annapolis. The government of Maryland is conducted according to the state constitution. The government of Maryland, like the other 49 state governments, has exclusive authority over matters that lie entirely within the state's borders, except as limited by the Constitution of the United States. 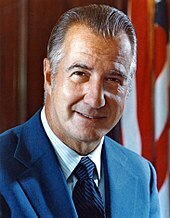 Spiro Agnew, former United States Vice President, is the highest-ranking political leader from Maryland since the founding of the United States. In 2010, Republicans won control of most counties. The Democratic Party remained in control of eight county governments including Baltimore. In 2014, Larry Hogan, a Republican, was elected Governor of Maryland. Hogan is the second Republican to become the Governor of Maryland after Spiro Agnew, who resigned in 1969 to become Vice President. In 2018, Hogan was reelected to a second term of office. 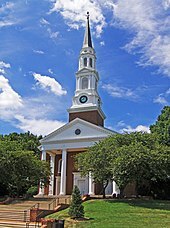 Memorial Chapel at the University of Maryland, College Park, Maryland's flagship university. Education Week ranked Maryland #1 in its nationwide 2009–2013 Quality Counts reports. The College Board's 9th Annual AP Report to the Nation also ranked Maryland first. Primary and secondary education in Maryland is overseen by the Maryland State Department of Education, which is headquartered in Baltimore. The highest educational official in the state is the State Superintendent of Schools, who is appointed by the State Board of Education to a four-year term of office. The Maryland General Assembly has given the Superintendent and State Board autonomy to make educationally related decisions, limiting its own influence on the day-to-day functions of public education. Each county and county-equivalent in Maryland has a local Board of Education charged with running the public schools in that particular jurisdiction. M&T Bank Stadium, home of the Baltimore Ravens. With two major metropolitan areas, Maryland has a number of major and minor professional sports franchises. Two National Football League teams play in Maryland, the Baltimore Ravens in Baltimore and the Washington Redskins in Landover. The Baltimore Colts represented the NFL in Baltimore from 1953 to 1983 before moving to Indianapolis. ^ "Maryland Facts". Maryland Office of Tourism. Retrieved June 2, 2009. ^ "Great Seal of Maryland (reverse)". Maryland State Archives. Retrieved March 4, 2014. ^ "Median Annual Household Income". The Henry J. Kaiser Family Foundation. Retrieved April 8, 2019. ^ "Maryland's Name". Catholic History of Maryland. Simon & Schuster. Retrieved July 20, 2012. ^ "Why Is It Named Maryland? - Ghosts of Baltimore". ghostsofbaltimore.org. May 19, 2015. Retrieved February 19, 2018. ^ 1940-, Krugler, John D. (2004). English and Catholic : the Lords Baltimore in the seventeenth century. Baltimore: Johns Hopkins University Press. ISBN 978-0801879630. OCLC 53967315. ^ a b c Andrews, Matthew Page (1929). History of Maryland: Province and State. Garden City, New York: Doubleday, Doran & Company, Inc. pp. 3–5. ^ "The Charter of Maryland : 1632". avalon.law.yale.edu. December 18, 1998. Retrieved May 2, 2018. ^ "Avalon Project - Maryland Toleration Act; September 21, 1649". avalon.law.yale.edu. Retrieved May 3, 2018. ^ "State Median Household Income Patterns: 1990–2010". U.S. Census Bureau. Retrieved August 6, 2012. ^ Somashekhar, Sandhya. "Government Takes Top Honors in Efficiency". The Washington Post. The Washington Post. Retrieved October 3, 2018. ^ "M2.0 – Maryland". Archived from the original on January 17, 2013. Retrieved November 25, 2012. ^ "M3.4 – Maryland Potomac-Shenandoah Region". Archived from the original on November 2, 2012. Retrieved November 25, 2012. ^ Reger, James P. "Earthquakes and Maryland". Maryland Geological Survey. Retrieved December 25, 2018. ^ "Maryland's Lakes and Reservoirs: FAQ". Maryland Geological Survey. January 24, 2007. Retrieved February 3, 2008. ^ Maryland.gov, "Maryland at a glance." Accessed December 3, 2018. ^ Rosenwald, Michael S. (July 30, 2012). "Fact: Maryland has no natural lakes". The Washington Post. Retrieved June 10, 2015. ^ a b Pamela Wood (March 27, 2017). "Maryland General Assembly approves fracking ban". The Baltimore Sun. ^ "MARYLAND AT A GLANCE: STATE SYMBOLS, Maryland State Flower – Black-Eyed Susan". Maryland Manual Online. Maryland State Archives. Retrieved May 20, 2014. ^ "Zone Hardiness Map through Prairie Frontier". Prairiefrontier.com. Retrieved October 24, 2010. ^ John Leeds Bozman (1837). The history of Maryland: from its first settlement, in 1633, to the restoration, in 1660; with a copious introduction, and notes and illustrations. J. Lucas & E.K. Deaver. p. 24. ^ a b c d "Hardiness Zones". Arbor Day Foundation. Retrieved March 5, 2013. ^ "Invasive Species of concern in Maryland". Mdinvasivesp.org. Retrieved October 24, 2010. ^ Therres, Glenn (Fall 2007). "Lions in our mountains? The mystery of cougars in Maryland" (PDF). Wildlife and Heritage. Maryland Department of Natural Resources. Archived from the original (PDF) on April 19, 2011. Retrieved July 6, 2009. Historically bobcats were distributed statewide but during the post colonization period densities began to plummet. By the mid-1900s, populations had probably reached all-time lows, with remnant populations existing only in western Maryland. This prompted the Department of Natural Resources (DNR) to classify them as a state-listed "Species of Special Concern." During the past quarter century, occupied range and densities have increased markedly. Results from the annual Bowhunter Survey and the Hunter Mail survey have identified bobcat sightings in 14 of Maryland's 23 counties. Currently, bobcats have dual legal classification in Maryland. In addition to the Species of Special Concern designation, they are also defined as a Game Animal / Furbearer with a closed harvest season. ^ "Coyotes in Maryland". Maryland Department of Natural Resources. Archived from the original on August 15, 2011. Retrieved September 16, 2011. Coyotes were historically a western species with core populations found west of the Mississippi River. Alterations and/or elimination of competing predators during the post-European colonization period facilitated rapid range expansion into eastern North America during the 20th Century. Established populations now occur in every state and province in North America. Coyotes are a relatively new addition to local ecosystems, and were first documented in Maryland during 1972. Initial substantiated sightings occurred in Cecil, Frederick and Washington counties. Since that time population densities and occupied range have expanded incrementally and coyotes now occur statewide. ^ a b c "Assateague Island National Seashore wild Ponies". Assateagueisland.com. Retrieved October 24, 2010. ^ a b "Chesapeake Bay Retriever History". K9web.com. Archived from the original on October 24, 2010. Retrieved October 24, 2010. ^ "Eastern Box Turtle". Maryland Biodiversity Project. Retrieved July 8, 2018. ^ "Maryland Government Website – Maryland State Bird". Msa.md.gov. June 7, 2010. Retrieved October 24, 2010. ^ "Official list of the birds of Maryland" (PDF). Maryland/District of Columbia Records Committee. Archived from the original (PDF) on July 9, 2018. Retrieved May 4, 2009. ^ Goodman, Peter S. (August 1, 1999). "An Unsavory Byproduct: Runoff and Pollution". Washington Post. p. A1. ^ Horton, Tom (January 1, 1999). "Hog farms' waste poses a threat". Baltimore Sun. ^ Wingfield, Brian; Marcus, Miriam (October 16, 2007). "– America's Greenest States". Forbes.com. Retrieved October 24, 2010. ^ "Program Design Archive | RGGI, Inc". www.rggi.org. Retrieved April 20, 2018. ^ "Snowfall Map". Retrieved October 24, 2010. ^ "NowData – NOAA Online Weather Data". National Oceanic and Atmospheric Administration. Retrieved December 17, 2012. ^ "Monthly Averages for Oakland, MD". weather.com. Retrieved September 28, 2013. ^ "Station Name: MD CUMBERLAND 2". National Oceanic and Atmospheric Administration. Retrieved March 5, 2013. ^ "Monthly Averages for Hagerstown, MD". weather.com. Retrieved September 28, 2013. ^ "Station Name: MD FREDERICK POLICE BRKS". National Oceanic and Atmospheric Administration. Retrieved March 5, 2013. ^ "Station Name: MD MD SCI CTR BALTIMORE". National Oceanic and Atmospheric Administration. Retrieved February 27, 2013. ^ "Monthly Averages for Elkton, MD (21921)". The Weather Channel. Retrieved May 21, 2017. ^ "Station Name: MD OCEAN CITY MUNI AP". National Oceanic and Atmospheric Administration. Retrieved March 5, 2013. ^ "Monthly Averages for Waldorf, MD". The Weather Channel. Retrieved May 21, 2017. ^ "Monthly Averages for Point Lookout State Park [Scotland, MD]". The Weather Channel. Retrieved May 21, 2017. ^ Stewart, George R. (1967) . Names on the Land: A Historical Account of Place-Naming in the United States (Sentry edition (3rd) ed.). Houghton Mifflin. pp. 42–43. ^ Masser, Kristin P. "Maryland In Focus -- St. Mary's County". msa.maryland.gov. ^ History of Maryland at 32. ^ a b c Wilder, Craig Steven (2016). "War and Priests: Catholic Colleges and Slavery in the Age of Revolution". In Beckert, Seth; Rockman, Seth (eds.). Slavery's Capitalism: A New History of American Economic Development. Philadelphia, PA: University of Pennsylvania. p. 233. ISBN 978-0-8122-4841-8. ^ a b c d Hubbard, Bill, Jr. (2009). American Boundaries: the Nation, the States, the Rectangular Survey. University of Chicago Press. pp. 21–23. ISBN 978-0-226-35591-7. ^ Tom (March 4, 2014). "Lord Baltimore's Map of Maryland in 1732". Ghosts of Baltimore. Retrieved February 24, 2019. ^ "Indentured Servants and the Pursuits of Happiness Archived January 4, 2010, at the Wayback Machine". Crandall Shifflett, Virginia Tech. ^ a b Paul Heinegg. Free African Americans in Virginia, North Carolina, South Carolina, Maryland and Delaware. Retrieved February 15, 2008. ^ Editors, History com. "Harriet Tubman". HISTORY. Retrieved January 18, 2019. ^ Dilts, James D. (1993). The Great Road: The Building of the Baltimore and Ohio, the Nation's First Railroad, 1828–1853. Palo Alto, CA: Stanford University Press. p. 80. ISBN 978-0-8047-2235-3. ^ Stover, John F. (1987). History of the Baltimore and Ohio Railroad. West Lafayette, IN: Purdue University Press. p. 18. ISBN 978-0-911198-81-2. ^ Walter Coffey (April 29, 2016). "Maryland Remains in the Union". The Civil War Months. Walter Coffey. Retrieved July 7, 2016. ^ Vogler, Mark E. (April 18, 2009). "Civil War Guard on duty in Baltimore to save President Street Station". eagletribune.com. Eagle Tribune. Archived from the original on April 19, 2009. Retrieved April 28, 2015. ^ a b "Maryland at a Glance: Nicknames". Maryland State Archives. September 29, 2015. Retrieved February 8, 2018. ^ "Bird's Eye View of Cumberland, Maryland 1906". World Digital Library. 1906. Retrieved July 22, 2013. ^ Dayhoff, Kevin (October 7, 2012). "Eagle Archive: Here's a toast to Maryland's origins as 'The Free State'". The Baltimore Sun. Retrieved February 8, 2018. ^ Cairns, Huntington (December 1937). "History and Constitutionality of the Maryland Income Tax Law". Maryland Law Review. Legal History, Theory and Process Commons. UM Carey Law. pp. 1, 6. Retrieved August 19, 2015. ...1937 Special Session of the Maryland Legislature imposed an income tax...expenditure of public funds for the benefit of able-bodied persons whose inability to support themselves arises from the prevalence of wide-spread unemployment. ^ a b "William Preston Lane Jr. Memorial Bay Bridge – History". baybridge.com. Archived from the original on July 1, 2008. Retrieved February 5, 2008. ^ a b "QuickFacts Maryland; UNITED STATES". 2018 Population Estimates. United States Census Bureau, Population Division. February 7, 2019. Retrieved February 7, 2019. ^ "Population and Population Centers by State – 2000". United States Census Bureau. Archived from the original on December 12, 2001. Retrieved December 5, 2008. ^ "The South As It's [sic] Own Nation". League of the South. 2004. Archived from the original on June 5, 2008. Retrieved May 23, 2008. On the other hand, areas beyond these thirteen States maintain their Southern culture to varying degrees. Much of Missouri remains basically Southern, as do parts of southern Maryland and Maryland's eastern shore. ^ Beck, John; Randall, Aaron & Frandsen, Wendy (June 27, 2007). "Southern Culture: An Introduction" (PDF). Durham, North Carolina: Carolina Academic Press. pp. 14–15. Retrieved May 23, 2008. Kentucky, Missouri, West Virginia [...] and Maryland —slaveholding states and regions before the Civil War that did not secede from the Union – are also often included as part of the South. As border states, these states always were crossroads of values and customs, and today [...] parts of Maryland seem to have become part of the "Northeast." ^ "Regions of the United States". American Memory. The Library of Congress. Retrieved August 11, 2009. ^ "Region 3: The Mid-Atlantic States". www.epa.gov. U.S. Environmental Protection Agency. Retrieved August 11, 2009. ^ "Your Local FBI Office". www.fbi.gov. Federal Bureau of Investigation. Archived from the original on August 15, 2009. Retrieved August 11, 2009. ^ "Routes Serving the Northeast". National Railroad Passenger Corporation. Archived from the original on August 15, 2009. Retrieved August 11, 2009. ^ "Best Regional Colleges". www.princetonreview.com. The Princeton Review. Retrieved August 11, 2009. ^ "Maryland Languages". City-Data. Retrieved September 14, 2016. ^ "Calvert County, Maryland's Success in Controlling Sprawl". Environmental Protection Agency. Retrieved September 3, 2016. ^ Shields, Todd (February 16, 1997). "On Edge". The Washington Post. Retrieved September 3, 2016. ^ Resident Population Data. "Resident Population Data – 2010 Census". 2010.census.gov. Archived from the original on November 18, 2011. Retrieved December 24, 2012. ^ a b Population Division, Laura K. Yax. "Historical Census Statistics on Population Totals By Race, 1790 to 1990, and By Hispanic Origin, 1970 to 1990, For The United States, Regions, Divisions, and States". Archived from the original on July 25, 2008. ^ "Maryland QuickFacts from the US Census Bureau". Archived from the original on February 7, 2015. Retrieved January 14, 2015. ^ "Maryland – Race and Hispanic Origin: 1790 to 1990". U.S. Census Bureau. Archived from the original on July 25, 2008. Retrieved April 18, 2012. ^ "Maryland QuickFacts". U.S. Census Bureau. December 23, 2011. Archived from the original on January 11, 2012. Retrieved January 14, 2012. ^ "Languages in Maryland" (PDF). U.S.ENGLISH Foundation, Inc. Archived from the original (PDF) on January 17, 2013. Retrieved May 22, 2012. Prince George's County has the highest percentage of Kru/Ibo/Yoruba speakers of any county in the nation. ^ Westley, Brian. "Washington: Nation's Largest Ethiopian Community Carves Niche" (Archived 2014-09-02 at WebCite). Associated Press at the USA Today. October 17, 2005. Also: "Washington: Nation's Largest Ethiopian Community Carves Niche." Associated Press at The Southeast Missourian. October 23, 2005. p. 7C. Retrieved on August 25, 2018. ^ "DC's "Little Ethiopia" has moved to Silver Spring and Alexandria". Greater Greater Washington. Retrieved August 25, 2018. ^ Data Access and Dissemination Systems (DADS). "American FactFinder – Results". Retrieved January 14, 2015. ^ a b "Irish Immigrants in Baltimore: Introduction, Teaching American History in Maryland". Maryland State Archives. Retrieved May 21, 2017. ^ a b Dastagir, Alia E. (May 23, 2011). "Swampoodle: The neighborhood behind the play". ABC Channel 7: TBD online magazine. p. 2. Archived from the original on June 6, 2013. Retrieved June 11, 2014. ^ "Washington, DC Genealogy Research, Resources, and Records: Irish Neighborhoods in Old Washington". genweb.org. Retrieved May 21, 2017. ^ "Mulberry Tree: College News: EXPLORE MARYLAND'S HISTORY IN IRELAND". St. Mary's College of Maryland online magazine. Spring 2014. Archived from the original on July 14, 2014. Retrieved June 11, 2014. ^ "About the Celtic Society of Southern Maryland". CSSM.org. Celtic Society of Southern Maryland. Retrieved May 21, 2017. ^ "European Immigrants in the United States". migrationpolicy.org. Retrieved January 14, 2015. ^ "Cities with the Highest Percentage of Russians in Maryland". Retrieved January 14, 2015. ^ Department of Legislative Services (June 2008). "Overview of Hispanic Community in Maryland" (PDF). pp. 6–7. Archived from the original (PDF) on January 17, 2013. Retrieved July 5, 2012. ^ "2017 GREATER WASHINGTON JEWISH COMMUNITY DEMOGRAPHIC STUDY" (PDF). Jewish Federation of Greater Washington. Retrieved February 28, 2019. ^ "Maryland Amish". Amish America. Retrieved October 6, 2017. ^ "Minority population surging in Texas". msnbc.com. Associated Press. August 18, 2005. Retrieved December 7, 2009. ^ Turner Brinton, "Immigration Bill Could Impact Maryland Archived December 21, 2013, at the Wayback Machine," Capital News Service, April 5, 2006. Retrieved July 22, 2007. ^ Yau, Jennifer (2007). "The Foreign Born from Korea in the United States". Migration Policy Institute. Retrieved December 23, 2007. ^ "About Us: Korean Americans in Maryland". Johns Hopkins Bloomberg School of Public Health. Retrieved December 23, 2007. ^ "Maryland". Freedom to Marry. Retrieved September 28, 2013. ^ "Maryland Quick Facts". United States Census Bureau. Retrieved July 25, 2017. ^ "Face it, we're on our way to being a majority minority country". Baltimore Sun. Retrieved July 25, 2017. ^ "States of Change: The Demographic Evolution of the American Electorate, 1974–2060" (PDF). Center for American Progress. Retrieved July 25, 2016. ^ a b "Religious composition of adults in Maryland". Religious Landscape Study. The Pew Forum on Religion & Public Life. 2017. Retrieved October 5, 2017. ^ It became a part of the District of Columbia when that city was created in the 1790s. ^ "Table 77. Christian Church Adherents and Jewish Population – States: 2008". United States Census Bureau. Archived from the original (Excel) on March 27, 2010. Retrieved October 24, 2010. ^ Dolan, Karen (January 30, 2012). "A better way of measuring progress in Maryland". Baltimore Sun. ^ Measuring Prosperity: Maryland's Genuine Progress Indicator | Solutions. Thesolutionsjournal.com. Retrieved on July 12, 2013. ^ "American FactFinder – Results". ^ Frank, Robert (January 15, 2014). "Top states for millionaires per capita". CNBC. Retrieved January 21, 2014. ^ U.S. Poverty Rate Drops; Ranks of Uninsured Grow washingtonpost.com. ^ Maryland is ranked as richest state baltimoresun.com. ^ US Poverty Rate Declines Significantly wibw.com. ^ "Monthly Labor Review - February 2018" (PDF). Maryland Department of Labor, License, and Governing. April 5, 2018. Retrieved April 20, 2018. ^ U.S. Army Corps of Engineers. Waterborne Commerce Statistics Center. New Orleans, LA. "Tonnage for Selected U.S. Ports in 2008." Archived July 31, 2010, at the Wayback Machine Revised February 17, 2010. ^ "Port of Baltimore". Automotive Logistics Buyers' Guide. Ultima Media. Archived from the original on May 25, 2017. Retrieved May 22, 2017. The Port of Baltimore handles more autos than any other US port. ^ "Chesapeake and Delaware Canal". Philadelphia, PA: U.S. Army Corps of Engineers. Retrieved September 28, 2013. ^ "Maryland's Bioscience Environment: 2009". The Maryland Biotechnology Center. Archived from the original on August 20, 2011. Retrieved August 19, 2011. ^ "Emergent BioSolutions Receives Orphan Drug Designation for BioThrax for Post-Exposure Prophylaxis of Anthrax Disease". Marketwatch.com. Dow Jones & Company. April 21, 2014. Retrieved August 29, 2016. ^ "MDOT Departments". Archived from the original on May 25, 2009. Retrieved June 5, 2016. Maryland Department of Transportation. Retrieved on March 23, 2009. ^ "College Park Aviation Museum Home". Collegeparkaviationmuseum.com. September 12, 2013. Archived from the original on July 27, 2009. Retrieved September 28, 2013. ^ "Frederick E. Humphreys: First Military Pilot". New York State Division of Military and Naval Affairs: Military History. December 9, 2008. Retrieved November 23, 2010. ^ Maryland Port Administration. Baltimore, MD. "Seagirt Marine Terminal." Retrieved October 31, 2011. ^ "Maryland State taxes". BankRate.com. Retrieved April 9, 2008. ^ "Maryland Income Tax Information – Local Tax Rates". Individuals.marylandtaxes.com. Archived from the original on September 20, 2008. Retrieved September 22, 2008. ^ a b Maryland State Board of Elections. "Voter Registration Statistics". ^ "American FactFinder - Results". ^ Feerick, John D. (2014) . The Twenty-Fifth Amendment: Its Complete History and Application (Third ed.). New York: Fordham University Press. pp. 132–133. ISBN 978-0-8232-5200-8. ^ Local and National Election Results – Election Center 2008 – Elections & Politics from. CNN.com. Retrieved on July 12, 2013. ^ "Official Gubernatorial General Election results for Maryland". The State Board of Elections. State of Maryland. Retrieved September 29, 2016. ^ "Republican Larry Hogan wins Md. governor's race in stunning upset". Washington Post. Retrieved January 14, 2015. ^ "About MSDE Archived January 6, 2009, at the Wayback Machine." Maryland State Department of Education. Retrieved on March 22, 2009. ^ de Vise, Daniel (February 5, 2009). "Md. Leads U.S. in Passing Rates on AP Exams". Washington Post. pp. B1. Retrieved February 18, 2009. ^ "Best High Schools: Gold Medal List". usnews.com. U.S. News & World Report. Retrieved November 7, 2009. ^ "UMB Fast Facts". University of Maryland, Baltimore. Retrieved May 21, 2017. ^ "Institute of Museum and Library Services - Maryland State Profile". IMLS. Retrieved February 26, 2019. ^ "Top 10 Maryland athletes in The Sun's 175-year history". Baltimore Sun. May 16, 2012. Retrieved March 16, 2013. ^ "State Symbols". Maryland State Archives. Retrieved December 6, 2007. ^ "STATE SYMBOLS: Marylanders take a walk, and eat cake too". Journalism.umd.edu. September 30, 2008. Retrieved September 28, 2013. Brugger, Robert J. (1988). Maryland, A Middle Temperament: 1634–1980. Baltimore: Johns Hopkins University Press. ISBN 978-0-8018-5465-1. Chappelle, Susan Ellery Green; et al. (1986). Maryland: A History of its People. Baltimore: Johns Hopkins University Press. ISBN 978-0-8018-3005-1. Denton, Lawrence M. (1995). A Southern Star for Maryland. Baltimore: Publishing Concepts. ISBN 978-0-9635159-3-3.